Mitch Headley called the meeting to order at 6:03 PM. There were approximately 45 residents in attendance. Mitch asked that we dispense with the reading of the minutes from the last meeting. A motion was made, seconded, and approved. The current board members were recognized. Jim Daum gave the Treasurer's report, which included a three-year average profit and loss statement showing average losses of $954. Losses are forecasted to increase in 2018 due to removal of dead trees in the Common area on Magnolia Drive, and the removal of the unsafe Dock on Lake #1. The losses are also due to 30% of the Homeowners not paying annual dues. Later in the meeting Jon McMillan expressed concern regarding these annual losses. A motion was made to increase annual membership dues $25 to help eliminate the losses. This motion was seconded and approved unanimously. 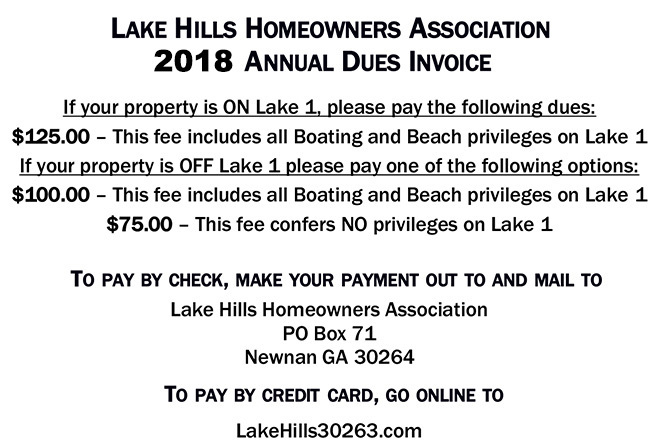 Effective with the 2019 dues billing, the Annual Membership Fee would be $150.00 for homes bordering Lake 1 with Lake 1 privileges. $125.00 for homes not bordering Lake 1 with Lake 1 privileges. $100.00 for homes not bordering Lake 1 without Lake 1 privileges. Jim reported cash of $33,000 and a CD of approximately $129,300 as of October 23, 2018. A question was asked regarding filing a lien on the property of residents who do not pay their dues. Mitch explained the HOA's restrictive covenants expired and were never renewed, and the reinstatement of the covenants requires a 100% affirmative vote. A motion was made to approve the Treasurer's report, it was seconded and approved unanimously. Lake 1 Rules and Regulations were distributed to all in attendance. Lowering of Lake 1 for Homeowner Maintenance was discussed among those present and recommended to lower Lake 1 by approximately two feet in the near future. There were no objections voiced. Ron Covey asked that the lake be lowered when it reaches a high level after heavy amounts of rain. Mitch recommended creating a sub-committee of residents bordering Lake 1 to manage the lowering. There are now four downed trees in Lake 1 that should be removed by the homeowners but have not to date. Recent quotes for cost to remove are high - $4,000. Lee Chitwood volunteered to head a sub-committee to approach the homeowners. It was recommended to clean-up the Spillway and have our landscape contractor quote on doing this work. Jim Daum handed out sign-up sheets for the following committees: Lake 1, Security, Signs, Communications, and Government. Directors - Eric Lambert, Joe Griffin, Joe Robinson, Chris Smith, Alicia French, Preston Fulmer, Sr., Preston Fulmer, Jr., Hunter Edwards, Rob Davis, Lee Davenport. The next Board Meeting is scheduled for November 13, 7:00 PM at Joe Robinson's Home. Please join us for the 2018 Homeowners Meeting on Tuesday, October 23, 2018, 6 PM at Newnan Carnegie Library, 1 Lagrange St, Newnan, GA 30263. Your dues help pay for maintenance of the entrances, beach and common grounds, security lighting, taxes, insurance, as well as stocking the lake and feeding the fish. Thank you. Select an option below to have your dues automatically charged each year through PayPal.